No dog breed in history has encountered more misunderstanding and vilification than the American pit bull. In fact, the pit bull is an all-American breed blessed with tenacious athletic ability, loyalty, intelligence, and high-energy. Pit bulls are not lap dogs or a dog for the sedentary person. They are not fashion accessories or macho symbols. They are a breed apart from every other canine. Sergeant Stubby, the U.S. Army’s original and still most highly decorated canine soldier. 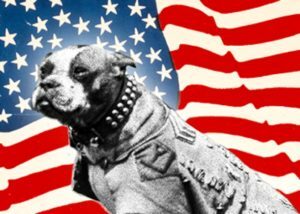 The pit bull was so respected in the early 1900s that the military chose the breed to represent the United States on World War I and World War II recruitment posters. Sergeant Stubby, a pit bull WWI war hero, served in 17 battles, was injured twice in battle, saved his entire platoon by warning them of a poison gas attack, and single-handedly captured a German spy. Stubby earned many medals for heroism, including one presented by General John Pershing, Commanding General of the U.S. Armies. Stubby’s obituary from the New York Times may be viewed at the Connecticut State Military Department’s website. 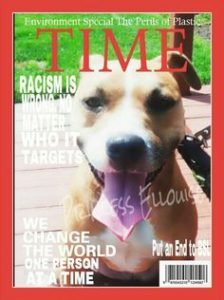 The American pit bull terrier is the only breed ever featured on the cover of Time magazine – and not just once but three times. Famous people who owned pit bulls include Theodore Roosevelt, Woodrow Wilson, George Patton, Jack Dempsy, Helen Keller, Humphrey Bogart, Fred Astaire, Anne Bancroft and Thomas Edison. 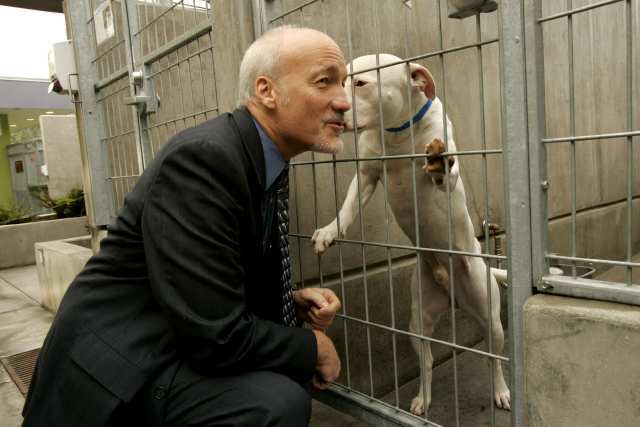 A few celebrities who own pit bulls today include Jon Stewart, Alicia Silverstone, Jessica Biel, Jessica Alba, Michael J. Fox, Bernadette Peters, Brad Pitt, Madonna, and Rachael Ray. Pit bulls are commonly used as therapy dogs. Whether they are visiting a senior care facility or helping someone recover from an emotional accident, pit bulls are exceptional therapy dogs. Pit bulls are also used in Search and Rescue work and serve as narcotic- and bomb-sniffing dogs. One pit bull, Popsicle (so named because he was found in an abandoned freezer), lays claim to the largest recorded single drug bust in Texas history. Pit bulls are great with kids too, as demonstrated by Petey, the beloved dog featured in “The Little Rascals.” Pit bulls were actually referred to as the “nanny dog” in the early 20th century because of their gentle and loving disposition with kids. Pits are known for their personality. Even as they age, most remain playful. They are affectionate dogs who appreciate their owner’s attention and approval more than anything else. While certain purebreds are prone to a long list of health problems, pit bulls are fairly healthy and hearty. They are strong and long-lived. They are low-maintenance because their short coats are easy to care for and you’ll have no grooming bills. Sadly, a lot of pit bulls never have a chance. Many shelters have a policy to euthanize all pit bulls, and do not adopt them out. Irresponsible individuals, bad breeders and biased media attention have given these wonderful dogs a bad rap. Breed-specific legislation has turned this beloved family pet into an outlaw in some communities. Fortunately, there are many people who are educating the public on the breed and dispelling the myths. According to The American Temperament Test Society, a national nonprofit organization for the promotion of uniform temperament evaluation of purebred and spayed/neutered mixed-breed dogs, the pit bull scores an 83.4 percent passing rate. That’s better than the popular Australian shepherd (81.5 percent), beagle (80.3 percent), border collie (79.6 percent), boxer (84 percent), Chihuahua (71.1 percent), cocker spaniel (81.9 percent), German shorthair (76 percent), Lhasa Apso (70.4 percent), and miniature poodle (77.9 percent) to name but a few. The American Temperament Test Society found that pit bulls were generally less aggressive when faced with confrontational situations that produced negative reactions in many other stereotypically “friendly” dog breeds, such as beagles and poodles. The National Canine Temperament Testing Association tested 122 breeds, and pit bulls placed the 4th highest with a 95 percent passing rate. The fact is that in most communities pit bulls are so popular that they account for the largest percentage of dogs rescued, adopted – and, sadly, euthanized. If you are interested in adopting a super dog, consider a rescued pit bull. Most shelters have adoption counselors standing by to help you select the perfect one for you and your family.